As a team we were quite scared of becoming 'digital' but we've actually really enjoyed the experience as a result of Looop being easy to create content on for all of us. It's easy to create an impressive looking resource with very little digital knowledge or experience. We have found this platform perfect for a growing business who didnt want to go full scale LMS (either in terms of cost or content. We wanted an quick launch that we could control completely ourselves and this has definitely been the case. We also design our content in house and so Looop lent itself to us putting all this online without needing to learn how to use elearning design software. "Love using looop - quick and easy to build content"
There's not really anything I dislike. As a consultant I recommend it to my clients. "Looks great, easy to use and fantastic support"
The support and guidance from Looop has been fantastic. Their approach and techniques for writing simple and genuinely learner-focused content have been inspirational. Looop have guided us on a journey taking material and experience from face to face training to create simple yet effective content that works brilliantly online. The platform is really straightforward and easy to use so once you have content written and images/vids made you can have it uploaded for users to access in no time at all. Our audience are mostly accessing learning on the go so the app was a really important feature for us. It looks smart and is easy to use. Not much. Where we have had stumbling blocks Looop have been quick to respond and find a solution. A really easy way to get up and running quickly with simple yet effective e-learning. We’re using Looop as part of our blended approach to training - upskilling both our colleagues and our customers with bespoke online and in-person learning experiences. It’s important to us that we create solutions that reflect the needs of every learner group. The ease of creating content means that we aren’t restrained by a one size fits all model. Every customer or department can have content tailored to their needs. The way Looop is structured means learners can access the resources they need when they need them. This helps us to prep people before workshops and to provide valuable resources afterwards to cement learning and provide immediate answers back in the workplace. We can continue to support learning in a way that we have not been able to do before. "Engaging and well-priced mobile learning tool"
I like the simplicity of how to use the tool and how it enables you to create bite-sized learning that's targeted and engaging. It looks great on Mobile as well as on PC which is important to our users and I really like the Analytics function which is great for getting an easy snapshot of usage. I don't think it has SAP nightly uploads so all employee data needs to be done manually. The guys at Looop do this for us on a monthly basis which is fine right now but in the long-term would be great for this to be addressed. A couple of users have also mentioned that having an offline version would be great too for when they're on long-haul flights for example. How to target a global audience with relevant bite-sized learning on a regular basis especially our people manager population. Have seen so much more engagement in using this tool versus a previous LMS. Get lots of comments from people about the relevance of the content and the fact the tool is mobile-friendly and easy to use. "Very fresh approach to L&D"
I’ve used several LMS’s in the past that simply didn’t cut the mustard, however the team at Looop have a very novel approach in the way that they design and think about learning content. It has really helped us to think much more about the user experience, and how we can actually help people to become better at their day jobs. The team do really challenge traditional thoughts towards training and creating learning content which can be difficult to get your head around at first, but you do soon realise that they’re completely right and we can be impacting people’s working lives so much more if we do it in the right way. I’ve realised that just because it’s the way you’ve always done it, doesn’t mean it’s the right way… The Looop approach has helped us to redefine many of our initiatives and deliver much more useful content to our employees. "If you are not using this platform yet you should be! " The ease at which you can identify a challenge and create 'useful' resources that help people do what they want to do better. Not only that but the support you get from the team at Looop is incredible. They treat each client as an important member of their community, and are happy to share their experiences to help you create the best campaigns possible. The interface is extremely user friendly and the look and feel is very current. Lastly...the price! I still can't believe the value you can deliver at the price point of this product. Love it. Not much in the way of dislikes. Whenever I've had an issue the team are always on hand to chat about it and love the feedback. Improvement and evolution is what underpins their mission. Induction, new starter training, continuous development, in the workflow performance improvement and management development. It seems like a lot? What I've realised is that you can pretty much be as creative as you want with this product. It can touch every part of the organisation if you want it to. 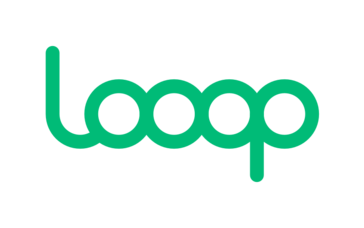 "Supporting us to create a friction free learner experience"
Looop is such an easy tool to use, that helps us get learning out there right at the point of need. The best thing though actually is the way the Looop team work with us to support the work we are doing and make recommendations about the best approaches. They are also so open to feedback and act on this! I genuinely don't have anything to add here. If there has ever been anything I haven't liked, Looop have acted on the feedback and made improvements. Just chat to the team as they will be able to provide lots of guidance as to how to land the tool well in your business. Looop helps us respond to business needs much faster and allows subject matter experts to create their own content with a little guidance from us. "Super easy to use, good functions and great support team"
How easy it is for me to upload resources and also the advice I have received from the team at Looop. I'm not computer savvy at all and even I could do it. Minor thing would be to be able to change the standard background colour. The banner is great as it jazzes up the landing page, but would be good to do more with the background. Also would like to be able to order the Themes on the landing page, as they are alphabetical. "Looop has helped us transform our L&D approach completely"
As a fast-paced, dynamic and customer centric business, it's important to us that the tools we use for our people reflect that, luckily for us Looop absolutely nails it. Our teams want answers to their challenges and questions instantly and Looop helps us help them do that, which is why it's been our preferred learning tool for the last 2 years. It's incredibly easy to create content, the UX is flawless and it looks like ours because of flexible customisation available. The events section needs to improve before we start to use it across the business - however I know further advancements are in the pipeline for the future. Use the Looop team, they know their stuff and can really help you kick start any initatives you're running. We have solved a number of buisness problems with Looop from performance reviews to absence management. Most notably Looop fully supports our new starters at every stage of their journey when they join ASOS (pre-boarding, first day, first few weeks to 3 months). Likewise we Looop to guide first time leaders who are newly promoted into the role and soon we will be creating resources to support all ASOSers with their career management. Lastly Looop has been used for major change projects across the business and later this year it will be the platform that provides our compliance training. Looop provides our employees with a consumer-grade desktop and mobile app experience. It sets us free from the LMS! It's easy to use so we can create context-rich digital resources for our people. The analytics allow us to measure success, and target our users in a more personalised way. Plus the team behind Looop are bright, motivated and super helpful. The event functionality is new and still evolving. Some navigational UX issues mean users can get lost in the content. Looop needs to be part of your overall learning strategy and design principles. The mindset is "point of need" and therefore you must invest the time to really understand your end user. Looop needs to have clear purpose for your target audience and be treated like a live digital product, not an LMS or sharepoint. Making manager development more point of need, context rich, and accessible continuous. We are evolving it as a "product" constantly - just as if it was a digital app or a website. This means we can make manager development continuous throughout the year rather than limited to a schedule programme. A manager's work is every day and Looop means we can make their learning every day as well. The platforms looks simple, clear and effective. It is extremely intuitive to use. The resources are easy to build and we've received very positive feedback about the short bite sized learning resources. Both managers and employees loved the concept and the style/tone of the resources. After using Looop in an onboarding context, managers were interested in introducing it in their business areas for their needs. I like that we can restrict the resources to different groups ie. using some of the same resources for the onboarding/pre-boarding site. The single sign on element also meets our security needs. We receive lots of questions regarding the 'domain' when employees sign in. Single sign on is normally quick and easy to use although sometimes this stalls employees. Adding email addresses in for single sign on can sometimes be time consuming. We receive a very high volume of queries from our new starters and so we have incorporated many FAQs on Looop. This will improve the employee experience making it more straightforward and meeting our digital aims. Similarly, it acts as a support for the business as we receive less queries or have 1 central resources hub which we can direct employees/managers to. The site also acts as a welcome to the company for new starters which they do not currently receive. The pictures, videos and interactive elements also make existing content much more engaging for our employees. The search element will empower our employees to find the answers they need in a quick, efficient manner. We will also be able to track their searches to ensure that our resources cover the FAQs. "Mobile-friendly, clean, easy to use and intuitive - what more could you want?" It's been a pleasure working with Looop to curate engaging learning resources for our employees, who have given us great feedback on the look, feel and nature of the content. The guys at Looop have worked hand in hand with us and consistently listened to our feedback to continue evolving the tool, and offer much more than just a social learning platform. They consult with us on a regular basis with research they're doing, what they're seeing in the market and some great tips - it's a very refreshing and collaborative approach! Occasionally there are some bugs, but anytime there is an issue we get a response from the team in less than 1 hour to resolve. We're using Looop to target certain groups, including our people manager population, and participants of our global mentoring programme, to deliver simple, visually appealing bite sized online learning resources. We always take the approach of "what problem are we trying to solve" when curating and then create relevant resources to deliver to the target population at a time when they need it most to inject a "spark" of inspiration. We've found creating these on Looop is quick and easy and the end product is high quality. "Looop has transformed how we help our managers learn and perform"
It is a simple and easy to use tool that our users love. The support we have from the Looop team is also excellent. "The Looop platform has shown me the future of elearning. We use for our inductions and planning on "
The new campaigns feature!!! Everything is automated AND personalised at the same time, so I can get on with my day to day job. Have been using it for a a year or so now and cannot think of anything. Love using looop its great and everyone is really helpful! We brought Looop in to help us with our inductions of new staff. The new staff will use Looop right at the beginning of joining our company to ensure they settle into the business quickly. As it's been a success we are planing on using Looop for more initiatives. We want to say thanks to the Looop team, especially Rachel for helping us lots! "Looop is a fantastic platform for anyone considering developing their online learning capability "
The simplicity of Looop means it takes seconds rather than hours to find relevant training modules that are easily digestible and relevant to a modern learner. Relevance is the real key! We work with businesses that have masses of training material all over their business, of which some of it is relevant and most of it is cumbersome and out of date. Looop brings together the relevant training into one site but also transforms the training messages to make them more relevant and easier to use and understand. "Does what it does pretty well"
The simplicity of Looop means that our developers can get key content out to our users as quickly as possible. Although it may look simple what more do you really need to deliver in terms of digital content? While an open structure can work for self-initiated learners, sometimes we need a bit more structure for things like induction content. If you want this to act like an LMS and the associated functionality look elsewhere, saying that if you don't need to track and report upon every interaction and want to get consistent resources to your users at speed, go for it. Quick creation of content, ability to deliver rich, video based resources, it's helping to change the culture around the benefit of timely and targeted bite-sized learning. "If you want to deliver beautiful short training with minimum fuss - use Looop"
Beautiful typeface and layout makes training content effortlessly professional - and compelling for the user. Looks just as good on mobile as on desktop. Very easy to pick up and use without training - people can come on board and immediately get productive. Would like some additional analytics - but admittedly we are using the app in an innovative way. Strongly recommend Looop - simple to use and creates great professional outputs. How to get graduates, interns and apprentices experimenting with new skills in the workplace and building performance improvement. How to get managers to deliver consistent graduate development when graduates are scattered in different locations globally. Benefits include significant behavioural improvements noted by managers, and graduates developing a self-directed culture. Looop have a great understanding of how people really learn. They have a fresh way of looking at providing support to the business in a way that they really need it. What I like the best is the way they encourage you to break down resources so that you are answering questions simply and effectively. It feels like we should have been doing this from day one. Its a way of getting information to people when they need it and I like the way it makes processes like joining a company or getting a new role feel really smooth. Looop are always there to help and are constantly looking for a way to make the platform better whilst staying true to its purpose which is really refreshing. The ability to search within the resource itself. We can only currently search the title and description butI know that functionality is on its way. On boarding new staff to the business. We have been able to make our on boarding experience so much more engaging by removing the business as usual information and putting that on Looop. We can really focus on giving people a fantastic first day. We have people compliment the pre-boarding experience all the time and thats because we have taken away some of the anxiety of joining a new company so you already feel like part of the family from day one and you can get started with your new role faster. We used Looop to enable our new managers to succeed as managers in our company. I cannot think of anything I dislike about the platform, it’s very easy to use and that’s perfect for me, especially as I am not the best at using computers! It is so easy to use, book a demo and get started straight away! Helping new managers to be as successful as possible. It was flagged in the employee survey that new managers felt they didn't get enough support. Looop has enabled us to change this. Ease of use when creating content, how the consumer has been thought about in the creation, the real time feedback you receive. when changes are made to the site, I think more than just an email should be sent - maybe a note on the live site that you then close down? "Excellent platform for showcasing content"
Looop is easy to navigate, use, and optimize. It makes highlighting great content so much easier and it's fun and engaging for the final users. I would love for their to be a way for learners to capture notes and key points to highlight. Some additional editing options for text would be great as well. Looop allowed us to get leader-surfaced content out to large groups of employees quickly and in an extremely engaging way. "Excellent tool for creating resource first learning"
Simple and easy to use. Clean looking site. Incredibly quick to build which means we can be responsive to business needs. Provides easy access resources for key questions our people have. Recently we've built a new onboarding platform to help our new starters get up to speed quicker. We're now in the process of creating something similar for newly promoted managers. Looop is intuitive which makes it simple to use and teach others to use as well. It's a clean, well structured layout for both series and individual resources making it easy for people to absorb information. We have a few issues with new members logging into Looop - needing to manually add people into the back end of the platform for them to then be able to use single sign-on. It would be great if this could somehow be a smoother process. Helping our new starters get inducted into the company quicker, making them more effective in their roles sooner and relieving some pressure from their managers. "Taking control of your online learning!" "Simple and engaging learner experience"
Making leader generated content easily accessible means our employees can learn from each other without having to be in the classroom. Looop has provided a solution to the problem of continuing knowledge and best practice sharing between peers across teams and locations. "Great easy to use system"
The fact that is has been built from a mobile first perspective so usabiilty is first class. To move the business from a linear approach to L&D to a more digital focus which enhances the skills and behaviours which are critical to our business. "Simple to create, simpler to use." It's fast and easy to create resources in Looop and very intuitive for learner's to use.. Although the analytics back-end is fine as it is, I think there's scope to left this further. "Beautifully Simple Tool for L&D Teams"
We’d like to add our company ‘font’ - however I have been informed this feature is coming. We are just finished with Cyber Security and are in the midst of building a workspace for our New Starter population. "New way to help staff"
So easy to use. It’s as much about the methodology that Looop bring as the platform itself. And it works - results have been fantastic. Nothing really. They’re always asking for my needs and are extremely responsive. Getting staff excited and knowledgeable about our company. As well as having key skills to be successful here. "The help and support from Ayse and Ben is outstanding"
The learning curve to understand a new way of thinking - once you get it - it is great! Ability to keep the learning alive to be agile, reactive and intuitive! "EASY & EFFECTIVE WAY TO GET STUFF TO PEOPLE AS & WHEN THEY NEED IT"
* We monitor all Looop reviews to prevent fraudulent reviews and keep review quality high. We do not post reviews by company employees or direct competitors. Validated reviews require the user to submit a screenshot of the product containing their user ID, in order to verify a user is an actual user of the product. Hi there! Are you looking to implement a solution like Looop?